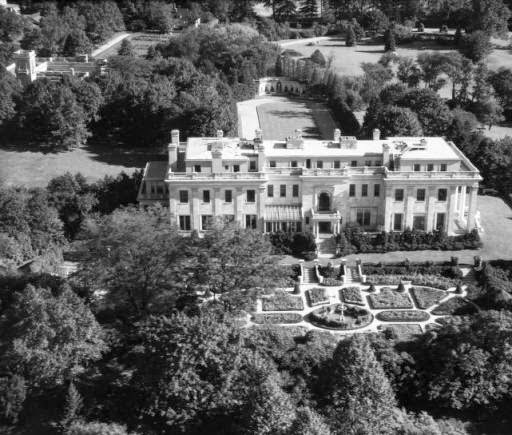 'Winfield Hall', the Frank W. Woolworth estate designed by C.P.H. Gilbert c. 1916 in Glen Cove. Click HERE for all previous posts on 'Winfield Hall'. Click HERE to see the estate on bing. Photo from SMU's Robert Yarnall Richie Collection. What is the status on the estate in 2015? I know the family offered it for sale a few times and not that long ago. The site of http://winfieldhall.info/ remains, but is unclear if they are marketing is more for events, photo shoots, et al or actually look for offers. Last fall I walked (illegally) the grounds of another lovely but hulking manse they own in Newport, RI. The taxes for both properties alone, let alone insurance & minimal upkeep, is enough to make one nauseous. Much googling does not reveal the origins of Martin and Millicent Carey's money, the owners of Winfield Hall and Seaview Terrace in Newport, RI, among other properties. They do tend to turn up in the news for not treating their properties well, however. With Martin in his 90s, I suspect both properties will be on the market soon, officially at least. While both are rather eccentric architecturally, Seaview Terrace is my preference by far. Regarding another OLI covered property: interesting (and rather big $$) that Easton was purchased by "Chinese buyers"